Great article – great summary. Histamine problems come in three forms a) consuming too much b) producing too much c) not metabolising enough. I’d love to see a follow up article on how to boost metabolism of histamine as many people have methylation problems that slow down histamine metabolism, not just DAO production. Wow, the feedback loop makes a lot of sense to me. I would faint every 15 weeks due to a drop in blood pressure. There was intense pain in the lower left abdomen, same place I’ve been getting the pain for 45 years. The fainting loop started when I began reducing Lamictal. I had seizures, had the surgery, became sz-free, so began reducing meds. Reduction took 4 years and I delayed med reductions once (because I didn’t want to get sick that week) and wound up fainting anyway. The cycle continued after I was off all meds until I changed my diet. I removed/reduced the high histamine foods from my diet and stopped fainting. When I removed all citrus, a few months later, my arm started to work again. I hadn’t been able to lift it above my shoulder for 4 years. It is important to check with an allergist about a drug allergy to NSAIDs (aspirin, naproxen/Aleve, ibuprofen, etc), as some people are very sensitive and the reaction could be even worse next time. We can develop allergies at any time in our lives. Increased intestinal permeability raises the risk of developing allergies. Alcohol and NSAIDs dramatically increase the permeability of the gut, allowing the invasion of bacteria and development of allergies. It is also possible that environmental allergies (mold, pollen, chemicals) are filling the “allergy bucket.” I’ve had similar allergic incidents when accidentally consuming gluten with my celiac disease, so identifying and treating food allergies and autoimmune conditions can help. Researchers are hunting for substances that can stabilize mast cells and prevent the vicious cycle. Some very exciting papers have outlined the benefits of probiotics, and I mentioned that taking different strains of probiotics including L. reuteri, L. rhamnosus, L. casei, and B. bifidum may work best. A high-quality refrigerated probiotic capsule is going to be more reliable, and yogurt does not usually contain all of these. Besides allergy testing, diet can reduce histamine and protect the gut lining. Environmental estrogens (pesticides, heavy metals, plastics, household chemicals) can also promote allergic disease. Hope your streak of bad luck will eventually bring new health and awareness! Best wishes. Since April of this year I have had poison ivy twice, a bee sting, and another bite/sting resulting in leg swelling. , I also had aspirin, aleve and red wine within a few days. I work outdoors. Last week I broke out in very bad hives that brought me to the ER twice. Even with prednisone and antihistimines , the hives and severe itching lasted one week. My question is can histamine build and accumulate in the body over a period of months before a histamine reaction occurs. Is there a threshold that when exceeded by too many triggers causes an acute response? Your article is awesome. Thanks. This is an important point. The second enzyme that breaks down histamine is histamine N-methyltransferase (HNMT) that only occurs in tissues and not body fluid, so direct assessment does not appear possible. We are also not clear on which enzyme should take the blame (DAO, HNMT, or possibly the related histidine decarboxylase that turns histidine into histamine). One very old paper predicted that HNMT was responsible for histamine degradation in skin. Apparently HNMT works inside the tissues, while DAO gets dumped into our bloodstream in order to manage histamine levels. The highest amounts of HNMT are in the kidney and liver, and it is the most important enzyme for breaking down histamine in the lungs. The urine test at the Mayo Clinic or Quest Diagnostics can check for N-methylhistamine which shows increased histamine production – usually a disorder of mast cells. There are genetic tests that show mutations in the HNMT gene, but I could not find one publicly available. There are a few associations between HNMT mutations and atopic dermatitis, myasthenia gravis, and asthma. One company has a genetic testing kit for Mast syndrome, but I could not see that it evaluated HNMT. My article focused on treating symptoms of histamine intolerance (despite genetic causes) with diet and lifestyle, as we cannot alter our genes. Some gastrointestinal diseases may reduce the enzymes, so treating them appropriately (as in the case of celiac) may likely have a positive effect. Crohn’s disease and ulcerative colitis associate with low DAO activity. My personal experiences with excessive mast cell degranulation were triggered by foods or allergens that normally would have been tolerable. However, my system was disrupted by recent accidental exposure to gluten in each case, setting me up for hypersensitivity. The best technical paper on histamine and the enzymes is published by Amer Journal of Clinical Nutrition. I see reference to DAO enzyme but am curious as to how you can check and see if there is a problem with the H-NMT enzyme. How can it be tested and where could it be done? Is mast cell activation disorder caused by reactions to high histamine foods? I had epilepsy as well, urticaria, leg edema and a few other problems. Poor kid! A prompt consultation with a naturopathic doctor is a great idea. Here is a link to the “Find a Naturopathic Doctor” service. I am not a doctor and cannot offer professional advice, but my personal experience and shared research may be helpful. The recent report on allergy remedies is worth reading as well. The basic IgE tests can be very limited – agave is not often tested but is known to trigger allergic reactions (not related to bees, only the agave plant). IgE in cells can last for weeks, resulting in mast cell degranulation, histamine production, and inflammation. Depending on which mast cells are activated, the symptoms can appear in the respiratory system, intestines, skin, lymph nodes, spleen, and liver. IgE levels increase in childhood and peak between age 10-15, so it seems important to identify as many triggers as possible right away. Thorough IgE tests should include airborne allergens like dust, mold, and pollens. While avoiding dietary and environmental allergens AND foods high in histamine (processed meat, fish, fermented foods and condiments, leftover meats, etc.) – the immune system can be boosted with B vitamins which help break down histamine. The only kid-friendly chewable B Complex supplement I found was on Amazon, and I give it to my kids. Vitamin C has also shown some anti-histamine effects, but all types of citrus allergies should be checked before consuming extra citrus. A natropathic doctor may advise on the safe dosage of vitamin C supplements. A diet rich in carotenoids might prevent the development of food allergies (in mice), and carotenoids are high in yellow, orange, and red plant foods like carrots, pumpkin and sweet potato. They are also high in spinach, kale, tomato, and Chinese cabbage. Again, allergenic foods should not be consumed. I do not consume much pumpkin because it is usually only available in a can with high histamine content. My personal experience with severe histamine reactions (lasting 2 weeks) consistently occurs after exposure to gluten (I am celiac and wheat/gluten intolerant). I become extremely sensitive to allergens within 1 weeks of accidental gluten exposure, experiencing 1-2 weeks of intense swelling and unbearable itching from allergens usually better tolerated (such as lavender or mint soaps). I benefitted from these remedies, though a simple anti-histamine drug may have been easier! • Soaking in cool water with 1/2 tsp of vitamin C crystals (=2000 mg from Trader Joe’s). • Acupuncture actually relieved the itching, but I used a Chinese practitioner with many years of experience with unusual cases. He also gave me seed beads that I taped to points in the ear that helped reduce itching for a few days while my system calmed down. • No strong chemicals, soaps or shampoos. I did not use homeopathic remedies in these cases of “overload” but do have great success with BioAllers drops for airborne allergies in different seasons. Because I’ve had success with nearly every BioAllers product, I suspect that their common ingredient Histaminum Hydrochloricum may be part of the secret to success. The extreme dilution of histamine may somehow encourage my body to develop tolerance to histamine, reducing symptoms – just a theory. Amazon carries the Bioron homeopathic pellets of histaminum. If celiac was not checked, a doctor should do the blood work for this asap. Research shows some groups of people who are diagnosed with celiac following chronic urticaria (hives). Gluten-free dieting (along with avoiding the other allergens) can help some cases of chronic urticaria and has helped my family avoid problems with skin, fatigue, digestion, and mood/concentration. Keep me posted, and good luck. Any information you may have would be much appreciated. I am going to homeopathic doctor soon to get some insight on how to build his immune system back up. Ask the doctor about checking DAO after all possible allergens have been tested. Sometimes we have to do our own sleuthing when tests are not available. Histamine intolerance is usually a sign of allergy overload. If the intestines are highly permeable (in the case of celiac), allergies to gluten as well as many other foods, pollens, and environmental substances can easily develop and dramatically raise histamine levels. It is known that airborne allergies can manifest as gastrointestinal symptoms, as in the case of birch pollen allergy – see research paper. An allergist might call this “pollen-associated food allergy” and it is important to identify and avoid as many allergens as possible until histamine/inflammation are under control. Be thorough in testing for all dietary and environmental triggers. US Biotek, for example, offers tests for 584 substances for IgE allergies. Sometimes we can narrow things down by simply leaving our environment – perhaps a weekend away and carefully noting changes in symptoms. Once the triggers are determined, look into sublingual immunotherapy as mentioned in my recent report. I’m fairly convinced I have a child (6 yrs old) with Histamine Intolerance. She looks like a textbook case to me (she has Celiac, can’t tolerate tomato, chocolate, and many many other high histamine foods). She has constant abdominal pain which gets progressively worse throughout the day. She is under the care of excellent physicians both at Children’s Hospital LA and Boston Children’s Hospital. The doctors are stumped as to what causes her pain despite a strict gluten free diet (we are excellent on this front and have done may eliminations except histamines). Still, the doctors discount my belief that she has Histamine Intolerance. I believe our allergist would order a DAO test for her. Do you know if the DAO test is accurate for children? Any other tests you suggest running at the same time? I prefer to draw blood as few times as possible from this little tyke–yet want/need as much info as possible to help her live a pain-free life! Thank you so much! There may be an underlying allergy that magnifies when alcohol raises permeability and increase histamine levels. Some allergies to consider with an allergist include gluten, corn, and yeast. Beer is made with “gluten” grains like wheat, barley or rye so you may want to check for celiac or gluten intolerance. There are a few gluten free beers now. Corn can be added to beer as well. Sometimes preservatives are added to beers. Yeast may be a likely suspect as it is high in beer and wine but cannot survive in the higher alcoholic content of liquor (over 20% or over 40 proof). A good article is listed at LivingWithout.com. Alcohol consumption increases intestinal permeability which increases risk of intestinal disorders as well as allergic symptoms, including anaphylaxis. I had never heard about histamine intolerance before tonight, but after getting really sick from one drinking beer I stumbled upon this. I am curious though about histamine and alcohol because I seem to have trouble with beer, and a bit with wine, but not with liquors. Can anyone tell me if that could be a histamine problem or is it something else? Thanks. Yogurt doesn’t contain all of the probiotics associated with reducing IgE (associated with histamine), but Lifeway Kefir does! Flavored kefir tastes like a yogurt smoothie and is offered at Whole Foods and health food stores. There are 12 active cultures in this kefir, and only 2-6 types of strains are available in yogurt. Some flavors of Stoneyfield and Silk Live Soy Yogurt containing the most variety (S. Thermophilus, L. Bulgaricus, L. Acidophilus, Bifidus, L. Casei, and L. Rhamnosus). So honestly, I eat different types of yogurt for taste and rely on kefir and probiotic capsules for therapeutic value. Dannon has tried to trademark a Bifidus strain in their yogurt, but it is simply a marketing term (Bifidus Regularis) for a strain of Bifidobacterium animalis. I’m curious…what was the name of the yogurt you eat with the different strains? Board certified allergists typically treat problems related to allergy – the most common reason for histamine overload. From there you can choose to suppress symptoms, use immunotherapy (see the next article), or explore underlying imbalances with a doctor of naturopathy or integrative medicine. Check out the AANP web site to find a naturopathic doctor in your area. Yes, a bacteria-aware diet would bring us much closer to controlling our body and brain! Research is indicating that intestinal bacteria can affect our health by controlling our intestinal permeability – our body’s security gates. A starchy sugary diet as well as certain bacteria overgrowth fuels “bad” bacteria and fungus, paving a direct path to disease. Certain fermented foods such as sauerkraut and kefir may support gut health through beneficial bacteria, but some people may not be able to tolerate these items until they reduce their total histamine load (which is the objective of this article). You mention acid blockers and food intolerance, an interesting connection. Excessive histamine in the stomach is reduced by acid blocking drugs such as H2 (histamine 2) receptor blockers. Yet, the suppression of stomach acid interferes with our ability to break down food particles (proteins) that can lead to food allergy. Risk of food allergy is increased with these drugs, so it seems that they create a vicious cycle of dependency: acid blocker -> food allergy -> excess histamine -> more acid blocker. While we are still very much in the dark when it comes to understanding gut bacteria, new research showed that H2 receptor blockers lowered the bacterial diversity in premature infants. Bacterial diversity is vitally important to maintaining a healthy gut and preventing disease. Many naturopathic patients have discovered that their heartburn is actually caused by poor a digestive system rather than an overactive one! Both digestive enzymes and supplemental hydrochloric acid (betaine hydrochloride) help relieve symptoms in many cases by supporting the body rather than suppressing it. In summary, certain diets like GAPS may not be easy for those lacking histamine-degrading enzymes, but keep in mind that even fruits and vegetables can accumulate histamines in storage and packages. The GAPS diet focuses fresh foods which consequently reduces the total exposure to histamine in most cases. What about histamine production from bacterial overgrowth. It is known that certain species of bacteria produce histamine (scrombroid poisoning) and there are a number of theories how gut dysbiosis is the cause of much food intolerance. For myself, I know an environmental change within myself accounts for much of my intolerance. I was only mildly intolerant to amines (I could eat some chocolate and cheese, but too much would give me symptoms), then I had acid blockers for indigestion (heredity issues with valve in my family) and my food intolerance went through the roof. The only things that have reduced my symptoms was eating a low amine diet and doing a diet protocol to heal my gut. The former alleviated symptoms but made me more and more sensitive. So much so, that I went looking for more information. The low amine diet had more refined starches and sugars that were feeding my dysbiosis and further damaging my gut. I started the GAPS diet and after a horrible start, my symptoms reduced dramatically. This diet is relatively high in histamine, which was not a problem after I healed my gut. I fell of the wagon and ate too many starches and sugars and I find myself intolerant again. Back to my diet protocol. I write this as I am concerned at how many diets inadvertently shift to higher levels of starch and sugar to avoid amines such as histamine. I think that an protocol based on changing your gut ecology should always be explored as genetic factors are not the only possibility. Especially if your symptoms have changed over the years, or are variable. Thank you for your in depth information. Does this also relate to being allergic to certain medications like aspirin, ibuprofen, iodine and being unable to wear gold or silver jewelry with nickel as an alloy. These issues along with food allergies seems to run in my family. This is by far the best article on this subject I have ever read. I have suffered from this since my teens and have spend countless amount of money with doctors. I have not incorporated a yogurt that has all the listed probiotics and I have seen a marked difference in my symptoms. I know eat it religiously and have told my brother to try it since he suffers as well. Where can I go to be tested and shown vitamins I should take and foods to avoid. I have bronchoasthma, and allergys to certain shellfish. Also have urticaria and tinnitus. Any help is greatly appreciated. Frequent heartburn also. Thank you for the very illuminating article. Very good information. Yes, the FDA histamine limit of 50 ppm in a sample of fish is used for detection, as it may indicate much higher toxic levels elsewhere in the fish or sampled lot. Histamine levels vary widely in the tissue and do not break down with cooking, freezing, or canning. Symptoms of scrombroid poisoning may result at 200 ppm or higher. Tuna, mahi mahi, and Swiss cheese seem to readily acquire the bacteria that form histamine, but certainly any food could be suspect if left alone in the right environment! Thank you so much for providing such great info. 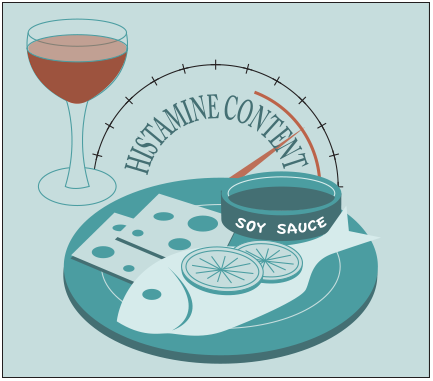 Do you know why FDA established a histamine level limit of 50PPM for certain seafood? Is it dectection limit? Very helpful article. Now i understand why my body is itching and swelling, I just need to discover the source. Much of the info was over my head, lol, but I learned from it nonetheless!! Unfortunately I continue needing to postpone the allergy test as I can’t seem to go more than the required 3 days of no antihistamines before the test. Spent last night in the ER as my throat was blocked. Maybe more answers soon. For immediate IgE allergies, an allergist can review your symptoms and recommend a skin, blood or food challenge test. IgE allergies produce immediate, uncomfortable symptoms as a result of IgE antibody/histamine production. However, testing for IgG antibodies is not often pursued by doctors, as there is no consistent link to delayed or chronic symptoms. Some people (like myself) have great experiences eliminating foods linked to my elevated IgG antibodies, while others are disappointed. Until we have a better understanding of the body, food elimination diets and challenge tests (under professional care) are the best way to identify problem foods. I usually recommend allergists for immediate diagnosis of histamine-related symptoms and naturopathic doctors for treating the underlying imbalances that provoke allergic conditions. Which test is recommend for allergy testing? Besides elimination diet. Is this through a naturopath? Granuloma Annulare (GA) is a term describing a poorly understood skin reaction that may relate to [delayed] type IV hypersensitivity – but not the familiar type I hypersensitivity that produces IgE antibodies and histamine. If other high-nickel foods such as almonds, peanuts, and wheat bran also trigger symptoms, you could discuss the possibility of a systemic nickel allergy with your doctor. Chocolate and spinach are also very high in oxalate which can affect autoimmune conditions as noted by researcher Susan Costen Owens. Any kind of allergic reaction is going to stress the immune system in ways that influence other immune conditions. There is a newer paper discussing GA at http://link.springer.com/article/10.1007/s40257-013-0029-5#page-1 – hope this helps! Granuloma Annulare is a skin disorder, which in my case is triggered by excess chocolate and spinach. I always associated those foods with an internal allergic reaction due to the high content of nickel contained in them. Are you saying that these foods contain high amounts of histamine or that my body produces more histamine as a reaction to the nickel? informative. Thanks. We’ll be publishing an article pertinant to your interests which you might find of interest. Histamine plays an unclear but important role in pregnancy, and high levels of DAO enzyme (that breaks down histamine) are produced by the placenta. In fact, high progesterone levels in pregnancy inhibit mast cell secretion (including histamine). Since elevated histamine has been linked to depression in certain cases, the sudden increase in histamine could theoretically contribute to the many factors of postpartum depression. Rare cases of breastfeeding anaphylaxis within 2-3 days of birth are thought to be triggered by the drop in progesterone and rise in prolactin. Taking antihistamines while breastfeeding has not been linked to any adverse effects on the infant, but evidence is surprisingly scarce in recent years. There is new concern that the mother can transfer allergens to the infant, and an allergen-avoidance diet (plus fish oil and probiotics) may help prevent allergic responses in the infant. If there is a DAO deficiency (blood tested) as well as depression, it would be interesting to see if the Histame product would help alleviate symptoms. If histamine intolerance can be triggered by a woman’s hormone levels could this be linked to baby blue or post part um disorders? There are a few lists on the Internet but the primary focus is PURE FRESH WHOLE foods. If I am doing any testing with chronic symptoms, I insist on avoiding anything packaged for 2-3 weeks during the test. If you are casually lowering histamine, check out this online list of allowed foods. Avoiding chocolate and cocoa powder is important and absolute torture! 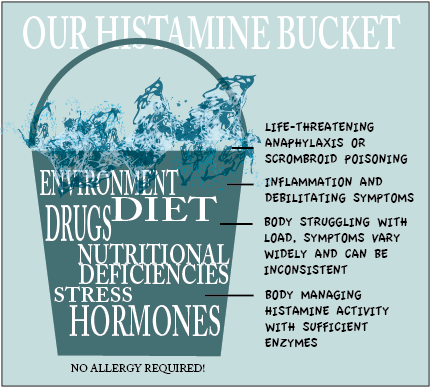 I wish someone would come up with a list of what we SHOULD be eating and drinking to avoid histamine symptoms. All the info about what to avoid is confusing, and confused by the things we ought to be having in order to enhance various vitamins and other elements. Being hypoglycaemic and coeliac the AVOID list does not leave me very much to eat !! 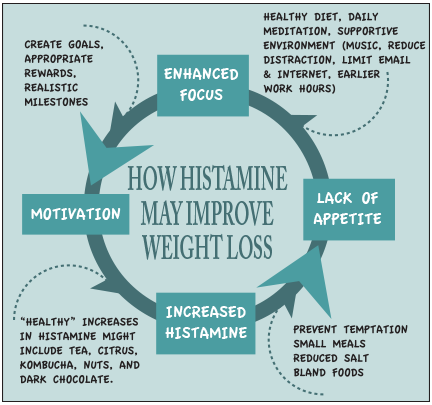 Thanks so much for this information on histamine – very in-depth and helps me understand how histamine behaves/functions in the body. I agree! Best most informative site I have seen yet. Have been trying to figure out the source of migraines for years. Dr.s of western medicine were no help. Plenty of medicine if you want, but no one was looking for the root cause. Got the most help from my Naturapath . Went down the candida trail for over a year on a very strict diet and things were better. Then had igg food allergy testing, showed 17 different food allergies. Amung which, Milk, eggs, wheat gluten pepper, omit and things got better. But still the foruruner symptoms to migraines would show up, stiffness, tiredness, dizzyness, swelling of blodvessels intemples and pain. Still some food and drink cause problems gave me problems. Bingo! It was histamines. Have had this all my life. Slow learner I suppose. DAO seems to help slightly when taken, experimenting with vitamin C and quercetin. Having no red wine and only small amounts of decaff coffee. Thank you for your information. see this discussion for testimonials. The supplements are expensive but easy to purchase on Amazon (with even more reviews) and must be taken before meals in order to work. The supplements are also not a cure in cases of underlying mast cell disorders. The best piece I ever read on histamine. Thank you! It is safest to get thorough allergy tests as soon as possible to determine if symptoms are a result of a true allergy. Symptoms might be life-threatening with repeated exposures, and you may not be able to communicate the suspected allergies in the case of an emergency. The relationship between histamine and surgery is complex and might apply to many of us who have experienced unusual allergic symptoms after a procedure. A study in France found that the most common triggers for surgery-related allergy were neuromuscular blocking agents, latex, and antibiotics. Metal allergies might also aggravated by certain types of stitches and implants. I would suggest careful identification of all contact, chemical, and drug allergies through skin or intradermal tests as soon as possible – and especially before any future surgery or dental work. It is even more intriguing that certain anesthetic drugs can impair histamine activity in various complex ways, appearing to contribute to the coma-like effect. Similarly, enhancing histamine activity in cells can help wake animals from anesthesia. While we are lacking research on the histamine-anaesthesia connection, I would guess that any swing in histamine level might disrupt our pendulum. This is an incredibly helpful article; thank you so much. I have a PhD in Genetics, which means I have just enough background in Immunology to come to all the wrong conclusions. After surgery two years ago, I told doctors I must be allergic to morphine and Percocet, since both made me itch horribly. This was dutifully noted on my chart and is reviewed each time I meet with a physician – NONE of my doctors have said, “Actually, that could just be a release of histamines from mast cells.” I had surgery again last week and I refused any narcotic pain medications because I wanted to avoid itchiness, but in the last two days, I have, nonetheless, been overcome with skin itchiness, which rapidly turns into large welts. I explained it to myself as a “hyper-active immune system” during healing and have kept myself away from my dog out of fear that I will develop an allergy to her while my immune system is running rampant. Now i understand better what is really going on. Thank you so much for this excellent collection of information. Perhaps mast cell disorders could be mistaken for histamine intolerance, but they typically involve very acute skin eruptions and diagnose with a series of blood and tissue analyses. We cannot yet identify our individual mast cell numbers, distribution, and underlying causes of accumulation. Mast cells, like histamine, are a deeper chain in the immune response, and we can attempt to reduce discomfort by stabilizing them and reducing their products (histamine). Genetics can also affect enzyme deficiencies and development of systemic mastocytosis (c-KIT mutation). Histamine intolerance (based on low DAO enzymes) is technically separate from mast cell disorders but could dramatically worsen symptoms. There is a blood test for DAO levels. Please share results if you choose to take DAO enzymes for mast cell activation syndrome or mastocystosis. If someone is being worked up for mast cell activation syndrome or other mast cell disorder… How can you tell the difference between an allergy to histamines versus a mast cell degranulation issue? Any way to properly distinguish upon testing or other assessment/interventions?? Dunwoody Labs in Georgia can run a DAO enzyme test – they send a kit to your health care provider who will take your blood and return it properly. A company in Australia will also analyze blood tests shipped from the US – visit the ImuPro web site. I cannot verify the credibility of these testing sources. Some people prefer to try the DAO enzymes (such as DAOsin and Histame) to see if they improve symptoms. Great article. Do you know anything about DAO testing in the US?